SpillFix is an effective Organic Absorbent made from coconut by-product. This "Green" product has a very small carbon footprint and no trees, mining or excessive transportation are involved in it's production. It has the ability to absorb all types of hazardous and everyday use liquids, even paint. It will remove spills and stains from driveways, garage floors and pit areas with ease. Use it to clean hands, tools and equipment, as it is safe and nonabrasive. You can also use it to remove pet accidents even on carpet. This revolutionary spill absorbent works instantly and can be re-used over and over again. Compared to it's competitors products, SpillFix is more affordable, easier to use, more absorbent, safe to breathe and can be disposed of in landfills. 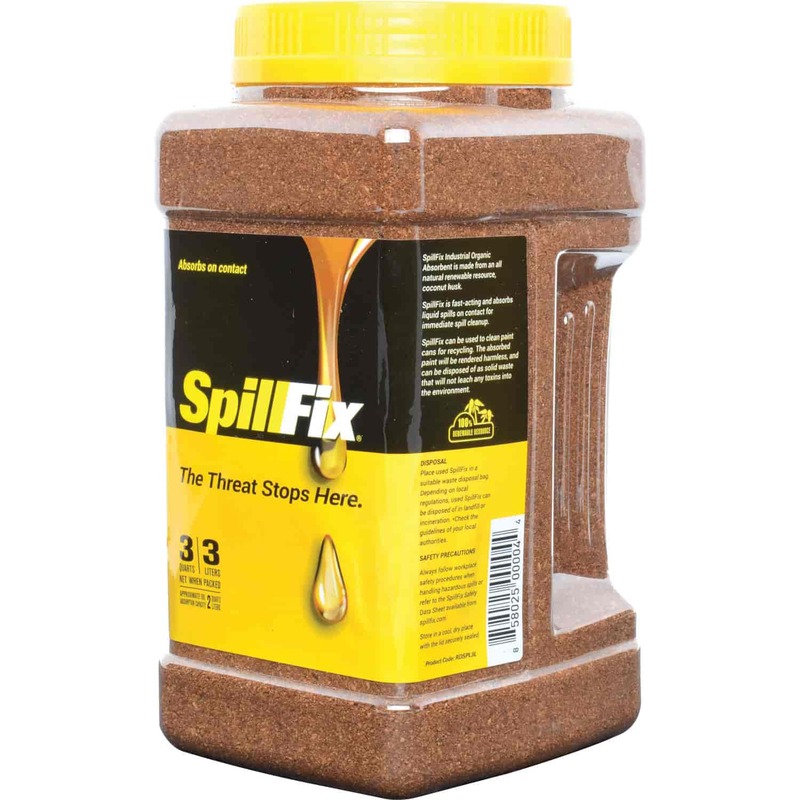 SpillFix is harmless to humans, animals and completely safe for the environment. RDSPL3L is rated 4.1 out of 5 by 8. Rated 5 out of 5 by Micro from Really works well. Works very well. I use it in the house. Let it soak overnight. I would buy it again. Rated 4 out of 5 by Tom 1955 from Works OK I only used it once and it didnt impress me too much. Worked as good as others on market. Rated 4 out of 5 by overbelt from Great absorber I bought this product couple weeks ago on the outside chance of having a need for it. Good thing I did, we had small accident of spilled fryer grease onto the floor of our kitchen. Took out one of the shaker bottles and started using it everywhere the grease spread. It absorbed the grease fast and I did not have to use a lot of material to get it contained. Rated 4 out of 5 by Phil1 from Good product really soaks up oil This is like the stuff that the janitor threw down on the school floors when there were "accidents". It works well and I am pleased with the quality. The best part is that you only need a broom with this stuff. Rated 1 out of 5 by DeeJay4 from Big disappointment! Did not absorb liquids. I tried it on pet urine and vomit. Both times it just stained my carpet with brown residue. And no matter how many times I vacuumed the area or used a carpet cleaner, it would not come out. I mean, at least if it ABSORED, it wouldn't be so bad. Geez, on TV, they poured cooking oil on a light colored rug and seconds later they were "gathering" the results in a small pile with their fingers, revealing a dry, clean surface.